Please join us this Saturday, July 14th at the Little Italy Mercato from 8:00 – 2:00pm for our last market of the Spring/Summer season. As a big thank you to all of you, we are offering one time only discounts to show our appreciation for your support. Stop by and say hi, let me know what your must haves are for Fall and take home one of our lovingly grown seedlings. Click here to see what we will have on hand and get your shopping list ready. 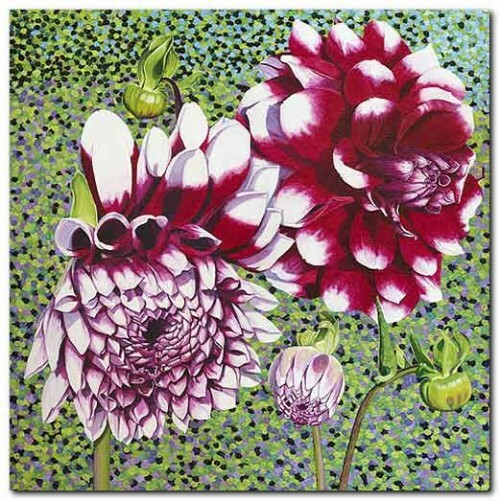 July is a time of in the garden that brings more reliable warm weather and with that a need for regular watering. Do your best to water late in the day after the sun starts to go down or early in the morning. Also now is your chance to get in corn, cucumber, eggplant, peppers, summer squash and melon to ensure one last harvest. Now should also be the time all of your hard work has begun to pay off and you are able to harvest some of your vegetables. Saturday, July 7th – Learn all about Oyster Mushroom Cultivation with SoCal Shrooms at Wild Willow Farms from 11:00 – 2:00pm. $30 signs you up for the class and gets you your very own take home oyster growing kit. 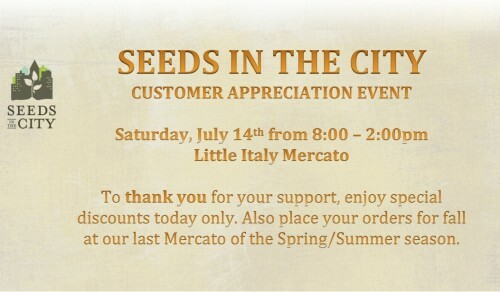 Saturday, July 7th – Visit Seeds in the City at our next to last summer weekend with a Little Italy Mercato booth from 8:00 – 2:00pm. We are located just west of India Street on Date. Monday, July 9th – Join the San Diego Horticultural Society as they welcome Nicholas Staddon, Director of New Plants for Monrovia. His talk will include some of the best ornamental plants for our area. $10 for non-members, 6pm at the Del Mar Fairgrounds. Saturday and Sunday, July 14th & 15th – SD Botanic Garden host the 2012 Insect Festival with tons of experts on hand and many kid friendly exhibits. Free with admission. Saturday, July 14th – Join Seeds in the City from 8:00 – 2:00pm at the Little Italy Mercato one last time as we say goodbye to spring and return back to the nursery to plan and prepare everything you need for your fall and winter gardens. Saturday, July 14th – Ecolife Foundation hosts a Village Aquaponics Workshop where you can learn how to best raise fish while growing your own food from 10:00 – 12:30 pm for $30. Sunday, July 15th – City Farmers Nursery teaches you how to Can & Preserve Your Harvest from 1:00 – 3:00pm. Saturday, July 21st – Plant it, grow it, eat it! Organically: Learn how to build a bed, plant and harvest organic produce with Seeds at City from 8:00 – 12:00pm, all proceeds benefit the urban farm. Saturday, July 21st – Visit the Lakeside River Park Conservancy from 9:00-11:00am for a free Composting Workshop with the Solana Center. Monday, July 23rd – Learn how to Raise Backyard Chickens with Cari Johnson of White Mountain Ranch. Hosted by the SD Edible Garden Society in rm. 104, Casa Del Prado at 6:30pm. Free. Saturday, July 28th – Visit the SD Botanic Garden from 2:00 – 3:00pm for Low Water, Low Maintenance Plants for Year Round Beauty. Landscape designer Linda Bresler will give you all the tips and inspiration needed to ditch your water hungry landscape. $15 for non-members. Saturday, July 28th – Join the SBBG for Walk & Talk: Plant Propagation Tips from 4:30 – 5:00pm. Walk the garden collecting cuttings to learn how to propagate and then take home. $3 donation.